We've rounded up the latest rental offerings via rental site Zumper to get a sense of what to expect when it comes to locating a rental in Chicago if you've got $2,200/month earmarked for your rent. Listed at $2,200/month, this one-bedroom, one-bathroom condo is located at 633 S. Plymouth Court, #205. When it comes to building amenities, expect on-site laundry and an elevator. The unit has both air conditioning and central heating, hardwood flooring, high ceilings, wooden cabinetry and stainless steel appliances. Pet owners, inquire elsewhere: this spot doesn't allow cats or dogs. Walk Score indicates that this location is extremely walkable, is convenient for biking and boasts excellent transit options. Next, there's this one-bedroom, one-bathroom condo located at 522 W. Superior St., #134. It's also listed for $2,200/month. The building features assigned parking, a fitness center, a roof deck and storage space. In the condo, there are hardwood floors, high ceilings, a fireplace, a dishwasher, wooden cabinetry, a breakfast bar, a balcony and stainless steel appliances. Attention, dog owners: Fido is welcome here. Here's a one-bedroom, one-bathroom apartment at 1544 W. North Ave., #37, that's going for $2,200/month. Amenities offered in the building include assigned parking. The apartment comes equipped with a dishwasher, stainless steel appliances, wooden cabinetry, in-unit laundry, hardwood flooring, high ceilings, a balcony and air conditioning. If you've got a pet, you'll be happy to learn that cats and dogs are welcome. Located at 2000 N. Lincoln Park West, #510, here's a one-bedroom, one-bathroom condo that's listed for $2,200/month. When it comes to building amenities, expect on-site laundry, a roof deck, an elevator, on-site management and a door person. The apartment has air conditioning, hardwood flooring, wooden cabinetry and stainless steel appliances. Luckily for pet owners, both dogs and cats are welcome. Walk Score indicates that this location is a "walker's paradise," is convenient for biking and has excellent transit. 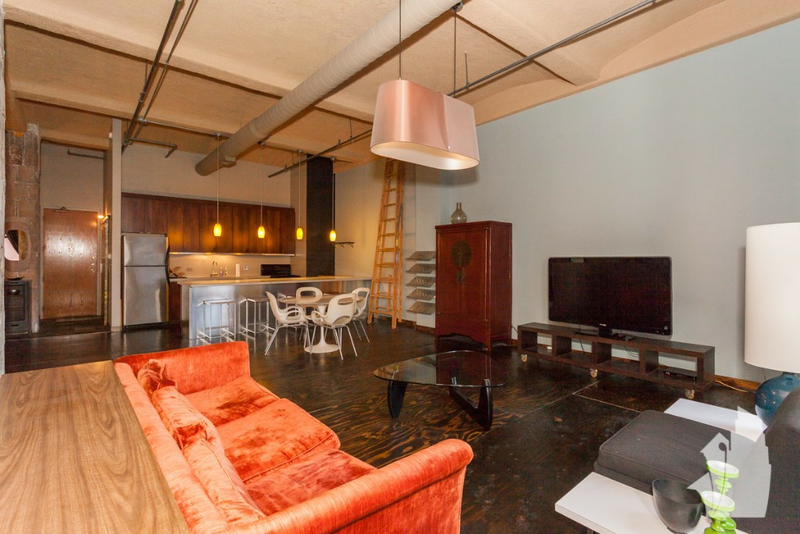 Finally, there's this one-bedroom, two-bathroom condo located at 1650 W. Adams St., #212. It's listed for $2,200/month. The building features garage parking, a fitness center, a roof deck, an elevator and storage space. Apartment amenities include a walk-in closet, air conditioning, hardwood flooring, a dishwasher, stainless steel appliances, wooden cabinetry, quartz countertops and in-unit laundry. Both cats and dogs are welcome. Per Walk Score ratings, the area around this address is very walkable, is easy to get around on a bicycle and boasts excellent transit options.